Anybody remember the folk song of binte bilihuta? It’s not only a song title, binte biluhuta is a corn soup from Gorontalo. Gorontalo province is known as the largest corn producer in Indonesia. Beside as an export commodity, sweet corns are main ingredients in the Gorontalo signature food, Binte Biluhuta. In addition to corns, this dish is also used other main ingredients, such as cakalang (known as skipjack tunas), tenggiri (king fish mackerels) and shrimps. Binte biluhuta or milu siram is a soup base dish that has very unique flavour. Sweetness from the corns, sourness from bilimbi and lime, hot from chilies. If you desire to complete the taste with bitterness, you may add chopped papaya leaves. The dish is very suitable during the cold weather, especially for those who are catching the flu. You may wonder why I made this whilst it’s summer now. Don’t you think it will be too hot to enjoy this. Winnipeg’s weather is entering the fall. Some days are hot and the other days are gloomy, rain and cold. I chose making this soup in the gloomy weather since I still have had fresh corns. In the local language, binte or milu means corn, biluhuta mean flush or pour. I guess, I can translate binte biluhuta as corn soup. Gorontalo is located on the northern part of Sulawesi island and was established in December 2000 after splitting from North Sulawesi province. No wonder if this dish uses cakalang and lemon basils which are popular in Manadonese food as well. Again, I said I’m lucky enough, surround by the Filipino community. I can find frozen cakalang at Asian stores. You got to know the science names in order to find fish names in other languages. Through this fishbase list, I found the Tagalog’s name for cakalang. 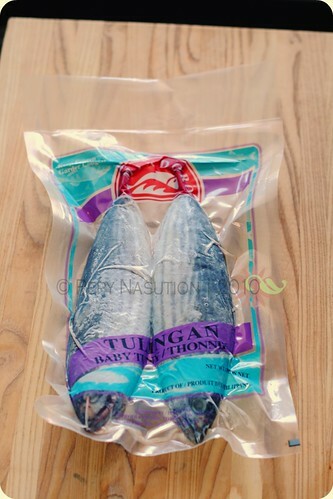 Thou many Indonesian sources stated that cakalang has a bigger size than tongkol (another variety of tuna which is very popular in the west part of Indonesia), cakalangs in Winnipeg are sold in big and small sizes. As you can see below, cakalang has a lighter skin colour than tongkol with strips on the body while tongkol has a darker skin colour with slimmer body and very popular in Java. Many people in Indonesia call cakalang as white tongkol. 1. Clean and rinse off the cakalang under running water. 2. Drizzle 2 key limes over and rub with salt. Set aside for 15 minutes. 3. Broil each side for 2 minutes at high. Cool down and shred the meat by hand. 1. In a pot, add water, corns and ground spices until the corn cooked. 2. Add grated coconut, shallots and bilimbi. Cook for the next 15 minutes. 3. Add shrimp and cakalang shredded; simmer for the next 5 minutes. Drizzle 2 key limes and add lemon basil. Stir and remove from the heat. Ready to serve. Sounds good, fish and corns soup. A very interesting soup! Well, the weather in London isn't any better.. it rained a lot last week and definitely I have felt that the autumn chill is on its way… sad!!! Glad you were able to find this type of fish familiar to you to make this tasty-sounding soup. I have never heard of such a combination of flavors, but I enjoy the taste of corn greatly so I would be very open to try it :). We are experiencing the same weather here in Seattle. There are many days when a seafood soup like this would be welcome! From the ingredients and cooking method, this dish reminds me of laksa sauce, but with corn added to it! Mmmh… Very mouthwatering! What an amazing intriguing combination of ingredients, a delicious corn soup! I must have missed that song too, but I would never miss that soup when you made it….it looks delicious! I have never used tuna in a soup and you certainly did a great job with in your recipe! I did not know there is a song associated with corn soup 🙂 ..I made a kind of corn soup sometime ago but I don't think there is a song associated with it. Lime and chili in corn soup sounds interesting, and the addition of chopped papaya leaves is a new concept to me. that recipe sounds really interested! You can substitute for other tunas or mackerels.